Posted on Thu, Dec 31, 2009 : 5:12 p.m.
Michigan head coach John Beilein looks on during the second half of an NCAA college basketball game against Indiana in Bloomington, Ind., Thursday. BLOOMINGTON, Ind. 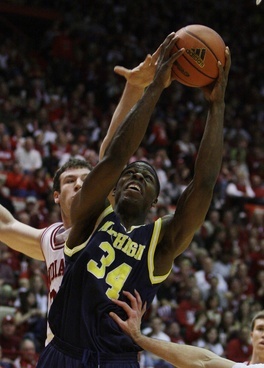 - Manny HarrisÂ landed on the bench an awful lot Thursday against Indiana. It wasn't his play that earned him a seat. For the first time all season, Michigan's talented junior guard was in significant foul trouble throughout the game. Harris played a season-low 30 minutes, grabbed a season-low one rebound and was below his scoring average and assists average. He finished with 13 points and making three assists. He also didn’t record a steal for the third time this season. Usually, college coaches get in trouble when they discuss officiating, especially when their team is flagged for 23 fouls like the Michigan basketball team was Thursday. Wolverines coach John Beilein instead praised the officials, blaming his team for committing silly fouls. Michigan fouled Indiana in its own backcourt. It hit jump shooters when they were taking 18-footers. Michigan forward DeShawn Sims (34) puts up a shot while being defended by Indiana forward Tom Pritchard during the first half of Thursday's game in Bloomington, Ind. The fouls put DeShawn Sims and Harris in foul trouble for the entire game. Sophomore guard Zack Novak and Sims eventually fouled out. More than anything, Beilein was bothered with the type of fouls Michigan committed, including six in less than three minutes early in the second half that led to Indiana being in the bonus from the 15:07 mark of the second half. Three games have passed since freshman guard Darius Morris went from the starting lineup to coming off the bench. The switch has worked well for Michigan. Stu Douglass has played better since being reinserted into the lineup. It also has sat well for Morris, the Los Angeles native who is still learning as he goes during his rookie year. “I feel like I’m just learning a lot right now. I know this team needs me to play not like a freshman and to do things out on the court when I’m on there,” Morris said. “I’m going to play minutes, sometimes I’m going to play a lot. I just have to be ready for whatever happens. Redshirt freshman center Ben Cronin, whose season and career are likely over after lingering effects of a hip injury, still traveled with the team to Bloomington. Michigan used a 2-3 zone more than a 1-3-1 in the second half due to foul trouble. Indiana had giant posterboard heads to wave at opposing team’s free-throw shooters during the game, including pictures of Rainn Wilson, Mario from Super Mario Brothers and John Krasinski. They're an idea Indiana coach Tom Crean brought with him from Marquette. Pam Morgan, the mother of injured Indiana guard Maurice Creek, gave the pregame talk to the Hoosiers. Fri, Jan 1, 2010 : 5:45 p.m.
Sims will never sniff the NBA. If Harris had gone pro after last season he would have been a 2nd rounder or undrafted. Would have been very foolish of him to leave last year. The way Sims is playing this year, I don't think it would have mattered if he left. Fri, Jan 1, 2010 : 5:41 p.m. I see Walmart is still waiting by his computer for UofM articles to be posted so he can spew his hatred. I see you have a new user name also. Guess your act got you banned again. Quite a life you've carved out for yourself. Fri, Jan 1, 2010 : 12:59 p.m.
Deshawn Sims will never play in the NBA. He is way too soft. Beilein didn't just win in the East, he also won in the NCAA's. This team needs an inside threat to collapse the defenses and open up the 3 point shots. Cronin's health issues are terrible for the kid and the school, but where are the other big recruits? 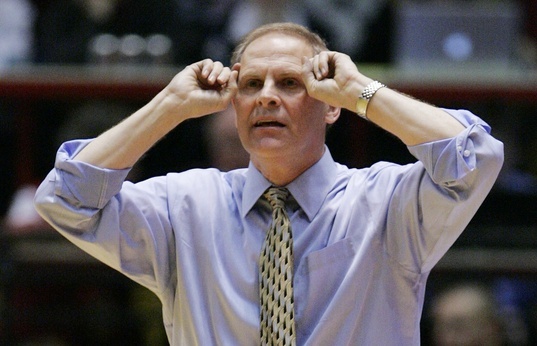 Fri, Jan 1, 2010 : 12:28 a.m.
Beilein's gimmick is already exposed. That small town gimmick (same in football) will not work in a big conference where basic sets still rule over gimmicks. The ineffectivity of SIMS inside the paint is the reason why this team lost to Indiana. Beilein's team is small, frail and SOFT. They do not play defense, rebound and score inside. They do not control the game. If the other team can shoot, this team folds. At this point we are looking at last place in the big ten. Too bad, all Beilein teams will be like this until he gets fired coz he recruits in the same small, frail way. Thu, Dec 31, 2009 : 11:58 p.m.
Manny Harris and Deshawn Sims are going to regret they did not turn pro last year. It was quite noble of them to return to school if that was their prime motivation. I suspect it was to improve their chance in the draft. Thu, Dec 31, 2009 : 10:54 p.m.
Is Steve Fisher still available? Thu, Dec 31, 2009 : 8:48 p.m.
Last place? Yay! Then we can be as good at basketball as we are at football! Thu, Dec 31, 2009 : 8:15 p.m.
7th place? That's something to shoot for. As it is right now, they are last until proven otherwise. Thu, Dec 31, 2009 : 7:41 p.m.